Your Local Auto Experts — Serving Merriam, Kansas City, Overland Park, Leawood, Shawnee & More! Please be advised: Done With Care Auto Repair has moved. We are now just south of the Merriam Farmer’s Market at 5810 Merriam Drive! We are proud to provide Merriam residents with an auto repair shop they can trust. We were founded with the goal of providing maintenance and auto repairs with integrity, honesty, and full transparency. We only suggest work you require to keep your vehicle safe, reliable, and we always take the time to get it right. Our auto repair shop is proud to serve the entire Kansas City area! We provide everything from used car inspections, to preventative maintenance and schedule auto repairs. If you have a company fleet, we will assign you a dedicated account technician to create and complete the customized fleet maintenance you require. All our work is guaranteed with our 3 year/36,000 miles NATIONWIDE warranty. Call to schedule your next auto repair, or schedule an appointment online here! Your Honest Alternative to the Dealer! Why spend your Saturday sitting at a dealership? Done With Care Auto Repair can provide you with the quality parts and repairs that meet or exceed all manufacturer's specifications, all while keeping your warranty intact! Not only do we deliver quality repairs by our factory-trained and ASE-certified technicians, but we perform each repair with care. What can we do for you? Factory Scheduled Maintenance—such as oil changes, tune-ups, new air filters, multipoint inspections, and more! We are dedicated to fair and honest pricing, but sometimes major repairs simply don’t fit in your budget. We know you need your car to drive the kids to school, yourself to work, and to keep your fleet up and running—which is why we offer financing through the CarCareONE credit card or Snap. If you qualify this will allow you to have your repair completed without leaving you cash-strapped. Your car might be in need of a repair, but you still have places to be. We make it as easy as we can by offering a free shuttle, after hours drop-off and pick-up, and a complimentary loaner car. If it is easier we will pay for your Uber! If you are looking for a shop whose team is skilled, and who truly cares about the quality of your repairs—you’ve found it! Read more about our shop, our code of ethics and what we believe in on our About Us page. The Safety & Reliability of Your Vehicle. Many auto repair shops perform inspections, but we use a fully digital format. We provide visual PROOF of our recommendations with high-resolution photos AND videos, along with a report on the condition of your vehicle. Our inspections are specifically designed to address safety issues FIRST, followed by reliability issues and preventative maintenance. Plus, they’re free with any service. 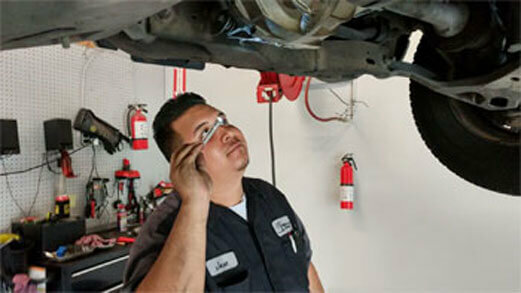 Our goal: Your vehicle serviced with honesty and integrity, keeping you safe and on the road. Need a ride? We’ll call you an Uber!